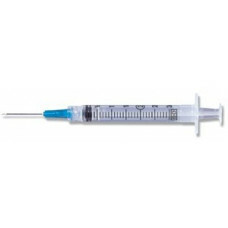 3ml BD Luer-Lok® Syringe with 22 gauge Needle. BD PrecisionGlide® needle, regular bevel, regular wall. Detachable needle. Worlds sharpest needle is combined with BD clear barrel featuring bold scale. 3ml BD Luer-Lok® syringe with positive plunger rod stop and tapered plunger rod design. Packaging is clearly labeled.